WIR05 focuses on the internationalization of research and development (R&D) by TNCs. This is not a new phenomenon. When expanding internationally, firms have always needed to adapt technologies locally to sell successfully in host countries. In many cases, some internationalization of R&D has been necessary to accomplish this. However, it was traditionally the case that R&D was reserved for the home countries of the TNCs. By contrast, now a number of new features are emerging in the internationalization process. In particular, for the first time, TNCs are setting up R&D facilities outside developed countries that go beyond adaptation for local markets; increasingly, in some developing and South-East European and CIS countries, TNCs’ R&D is targeting global markets and is integrated into the core innovation efforts of TNCs. Consider the following illustrations. Since 1993 when Motorola established the first foreign-owned R&D lab in China, the number of foreign R&D units in that country has reached some 700. The Indian R&D activities of General Electric — the largest TNC in the world — employ 2,400 people in areas as diverse as aircraft engines, consumer durables and medical equipment. Pharmaceutical companies such as Astra-Zeneca, Eli Lilly, GlaxoSmithKline, Novartis, Pfizer and Sanofi-Aventis all run clinical research activities in India. From practically nothing in the mid-1990s, the contribution by South-East and East Asia to global semiconductor design reached almost 30% in 2002. STMicroelectronics has some of its semiconductor design done in Rabat, Morocco. General Motors (GM) in Brazil competes with other GM affiliates in the United States, Europe and Asia for the right to design and build new vehicles and carry out other core activities for the global company. There are many such examples. In theory, the internationalization of R&D into developing countries is both expected and unexpected. It is expected for two reasons. First, as TNCs increase their production in developing countries, some R&D (of the adaptive kind) can be expected to follow. Second, R&D is a form of service activity and like other services, it is “fragmenting”, with certain segments being located where they can be performed most efficiently. Indeed, according to a survey of Europe’s largest firms conducted in 2004 by UNCTAD and Roland Berger, all service functions — including R&D — are now candidates for offshoring. It is unexpected in that R&D is a service activity with very demanding skill, knowledge and support needs, traditionally met only in developed countries with strong national innovation systems. Moreover, R&D is taken to be the least “fragmentable” of economic activities because it involves knowledge that is strategic to firms, and because it often requires dense knowledge exchange (much of it tacit) between users and producers within localized clusters. It is clear that, to date, only a small number of developing countries and economies in transition are participating in the process of R&D internationalization. However, the fact that some are now perceived as attractive locations for highly complex R&D indicates that it is possible for countries to develop the capabilities that are needed to connect with the global R&D systems of TNCs. From a host-country perspective, R&D internationalization opens the door not only for the transfer of technology created elsewhere, but also for the technology creation process itself. This may enable some host countries to strengthen their technological and innovation capabilities. But it may also widen the gap with those that fail to connect with the global innovation network. …with important implications for innovation and development. Innovative activity is essential for economic growth and development. Moreover, sustainable economic development requires more than simply “opening up” and waiting for new technologies to flow in. It demands continuous technological effort by domestic enterprises, along with supportive government policies. With the increasing knowledgeintensity of production, the need to develop technological capabilities is growing. Greater openness to trade and capital flows does not reduce the imperative of local technological effort. On the contrary, liberalization, and the open market environment associated with it, have made it necessary for firms — be they large or small, in developed or developing countries — to acquire the technological and innovative capabilities needed to become or stay competitive. R&D is only one source of innovation, but it is an important one. It takes various forms: basic research, applied research and product and process development. While basic research is mainly undertaken by the public sector, the other two forms are central to the competitiveness of many firms. In the early stages of technological activity enterprises do not need formal R&D departments. As they mature, however, they find it increasingly important to monitor, import and implement new technologies. The role of formal R&D grows as a firm attempts significant technological improvements and tackles product or process innovation. For complex and fast-moving technologies it is an essential part of the technological learning process. But the process of acquiring technological capabilities is slow and costly. Technical change and advanced science-based technologies in many industries call for more high-level skills and intense technical effort. These require better infrastructure, not least in information and communication technologies (ICTs). They also require strong supporting institutions, as well as stable and efficient legal and governance systems. Finally, they require access to the international knowledge base, combined with a strategy to leverage this access for the benefit of local innovation systems. The cumulative forces that are increasing the gap between countries with respect to innovation make the role of policy increasingly important at both the national and international levels. There are large differences in countries’ capabilities to innovate and benefit from the R&D internationalization process. 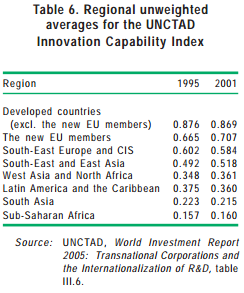 According to a new measure of national innovation capabilities — the UNCTAD Innovation Capability Index — the differences appear to be growing over time (table 6). Developed countries fall into the high capability group, as do Taiwan Province of China, the Republic of Korea and Singapore, along with some of the economies of South-East Europe and the CIS. The medium capability group comprises the remaining economies in transition, most of the resourcerich and newly industrializing economies and two subSaharan African economies (Mauritius and South Africa). The low capability group contains most of the subSaharan African countries as well as several countries in North Africa, West Asia and Latin America. Among developing countries, SouthEast and East Asia are the leaders in innovation capability, while the position of Latin America and the Caribbean has deteriorated over time and has been overtaken by North Africa and West Asia. TNCs are the drivers of global R&D. Global R&D expenditure has grown rapidly over the past decade to reach some $677 billion in 2002. It is highly concentrated. The top ten countries by such expenditure, led by the United States, account for more than four-fifths of the world total. Only two developing countries (China and the Republic of Korea) feature among the top ten. However, the share of developed countries fell from 97% in 1991 to 91% in 2002, while that of developing Asia rose from 2% to 6%. Similarly, there has been a rise in innovation outputs (as measured by the number of patents issued). For example, between the two time periods of 1991-1993 and 2001-2003, the share of foreign patent applications from developing countries, South-East Europe and the CIS to the United States Patent and Trademark Office, jumped from 7% to 17%. TNCs are key players in this process. A conservative estimate is that they account for close to half of global R&D expenditures, and at least twothirds of business R&D expenditures (estimated at $450 billion). These shares are considerably higher in a number of individual economies. 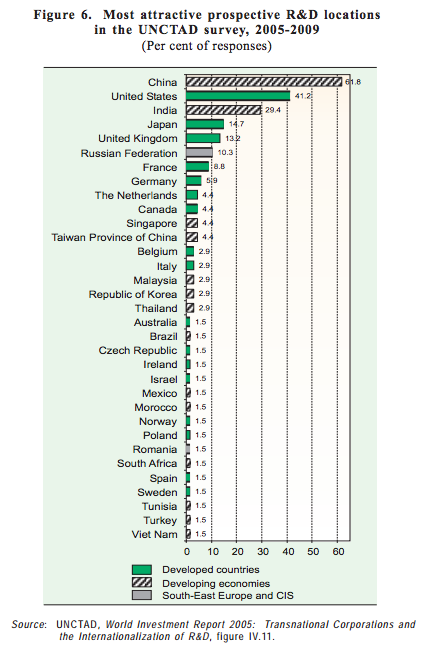 In fact, the R&D spending of some large TNCs is higher than that of many countries (figure 3). 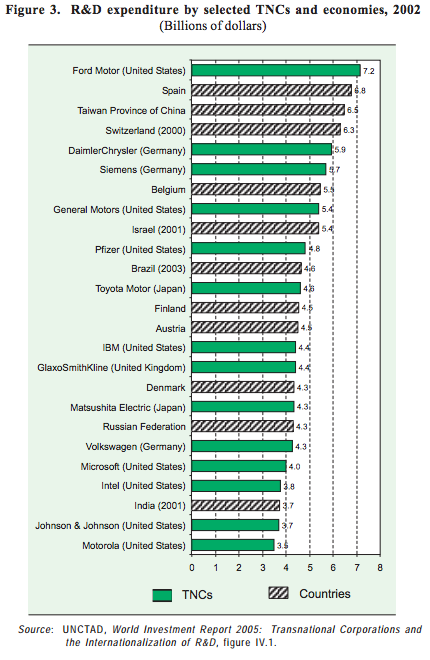 Six TNCs (Ford, Pfizer, DaimlerChrysler, Siemens, Toyota and General Motors) spent more than $5 billion on R&D in 2003. In comparison, among the developing economies, total R&D spending came close to, or exceeded, $5 billion only in Brazil, China, the Republic of Korea and Taiwan Province of China. The world’s largest R&D spenders are concentrated in a few industries, notably IT hardware, the automotive industry, pharmaceuticals and biotechnology. The R&D activities of TNCs are becoming increasingly internationalized. This trend is apparent for all home countries, but starts from different levels. In the case of United States TNCs, the share of R&D of their majority-owned foreign affiliates in their total R&D rose from 11% in 1994 to 13% in 2002. German TNCs set up more foreign R&D units in the 1990s than they had done in the preceding 50 years. The share of foreign to total R&D in Swedish TNCs shot up from 22% to 43% between 1995 and 2003. Reflecting the increased internationalization of R&D, foreign affiliates are assuming more important roles in many host countries’ R&D activities. Between 1993 and 2002 the R&D expenditure of foreign affiliates worldwide climbed from an estimated $30 billion to $67 billion (or from 10% to 16% of global business R&D). Whereas the rise was relatively modest in developed host countries, it was quite significant in developing countries: the share of foreign affiliates in business R&D in the developing world increased from 2% to 18% between 1996 and 2002. The share of R&D by foreign affiliates in different countries varies considerably. 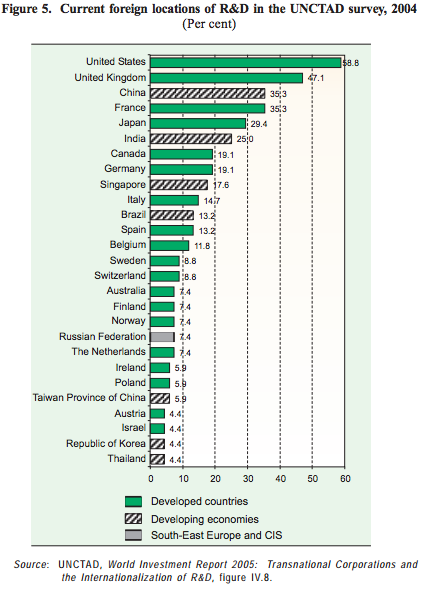 In 2003 foreign affiliates accounted for more than half of all business R&D in Ireland, Hungary and Singapore and about 40% in Australia, Brazil, the Czech Republic, Sweden and the United Kingdom. 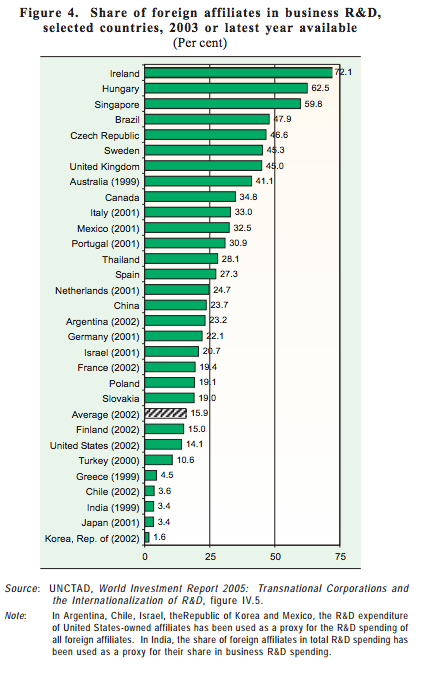 Conversely, it remained under 10% in Chile, Greece, India, Japan and the Republic of Korea (figure 4). Other indicators, such as the rising number of R&D alliances and growing patenting activity, similarly confirm the increased internationalization of R&D activities in developing countries. The share of host developing countries in the global R&D systems of TNCs is rising, but unevenly. Only a few economies have attracted the bulk of the R&D activity. Developing Asia is the most dynamic recipient. In the case of R&D expenditures by majority-owned foreign affiliates of United States TNCs, for example, the share of developing Asia soared from 3% in 1994 to 10% in 2002. The increase was particularly noticeable for China, Singapore, Hong Kong (China) and Malaysia. In the foreign R&D activities of Swedish TNCs the share of countries outside the Triad more than doubled, from 2.5% in 1995 to 7% in 2003. Survey findings and other data for Germany and Japan support the growing importance of developing countries and some economies in transition as locations for TNCs’ R&D. Official statistics generally suffer from time lags, and may not fully capture the pace of R&D internationalization. More recent data on FDI projects indicate that the expansion of R&D to new locations is gaining momentum. Of 1,773 FDI projects involving R&D worldwide during the period 2002-2004 for which information was available, the majority (1,095) was in fact undertaken in developing countries or in South-East Europe and the CIS. Developing Asia and Oceania alone accounted for close to half of the world total (861 projects). A survey of the world’s largest R&D spenders conducted by UNCTAD during 2004-2005 also shows the growing importance of new R&D locations. More than half of the TNCs surveyed already have an R&D presence in China, India or Singapore. In South-East Europe and the CIS, the Russian Federation was the only significant target economy mentioned by the responding firms as hosting R&D activities (figure 5). In the same survey, as many as 69% of the firms stated that the share of foreign R&D was set to increase; only 2% indicated the opposite, while the remaining 29% expected the level of internationalization to remain unchanged. The momentum appears to be particularly strong among companies based in Japan and the Republic of Korea, which until recently, have not been internationalizing their R&D to any large extent. For example, nine out of ten Japanese companies in the sample planned to increase their foreign R&D, while 61% of European firms stated such intentions. A further shift in terms of R&D locations towards some developing, South-East European and CIS markets is also envisaged (figure 6). China is the destination mentioned by the largest number of respondents for future R&D expansion, followed by the United States. In third place is India, another significant newcomer location for R&D. Other developing economies mentioned as candidates for further R&D by some respondents include the Republic of Korea, Singapore, Taiwan Province of China, Thailand and Viet Nam. Very few respondents indicated any plans to expand R&D to Latin America or Africa. The Russian Federation was also among the top 10 target locations. Another new and notable trend in the internationalization of R&D is the emergence and fast growth of foreign R&D activities of developingcountry TNCs. This trend is driven by the need to access advanced technologies and to adapt products to major export markets. Some of these TNCs are targeting the knowledge base of developed countries, while others are setting up R&D units in other developing economies. The R&D conducted in different locations varies considerably by region and economy. For example, in 2002, three-quarters of the R&D of United States majority-owned foreign affiliates in developing Asia were related to computers and electronic products, while in India over threequarters of their R&D expenditure went into services (notably related to software development). In Brazil and Mexico, chemicals and transport equipment together accounted for over half of all R&D by United States foreign affiliates. Moreover, TNCs carry out different types of R&D abroad. Foreign affiliates of TNCs may undertake adaptive R&D, which ranges from basic production support to the modifying and upgrading of imported technologies. Innovative R&D involves the development of new products or processes for local, regional or (eventually) global markets. Technology monitoring units are established to keep abreast of technological development in foreign markets and to learn from leading innovators and clients there. While it is difficult to quantify R&D by type, among developing host economies the evidence points to the predominance of Asia in innovative R&D for international markets. R&D activities in selected Asian economies such as China, India, the Republic of Korea and Taiwan Province of China are becoming increasingly important within the global R&D networks of TNCs. Examples include the Toyota Technical Center Asia Pacific in Thailand, Motorola’s R&D network in China and Microsoft’s sixth global research centre in Bangalore, India. Some of the innovative R&D conducted there is at the cutting edge. The semiconductor industry is an example. One of the earliest to move production into developing countries, it has also been among the first to move advanced design to selected developing economies in Asia. Some of the design is done by foreign affiliates and some by local firms. A few firms from the Republic of Korea and Taiwan Province of China, and to a lesser extent from China and India, for instance, are now at the technology frontier of design work. TNCs have so far located limited R&D in Latin America and the Caribbean. Relatively little FDI in Latin America and the Caribbean is in R&Dintensive activities; when it is, the R&D conducted is mostly confined to the adaptation of technology or products for local markets, called “tropicalization” in the Latin American context. Some important exceptions exist in Brazil and Mexico in particular. In Africa, the R&D component of FDI is generally very low; with the exception of some countries such as Morocco and, especially, South Africa, R&D by TNCs is virtually nonexistent. This is partly because of weak domestic R&D capabilities, and in many cases the absence of institutional mechanisms that create sufficient incentives for investors to devote resources to R&D. In some of the new EU members, foreign affiliates have emerged as important R&D players. In the Czech Republic, Hungary and Poland, R&D by foreign affiliates is often linked to manufacturing, mostly in the automotive and electronics industries. Some foreign affiliates also conduct “innovative” R&D for regional or global markets. The need to adapt products and processes to key host-country markets has always been an important motive for TNCs to internationalize R&D. The need to tap into knowledge centres abroad to source new technologies, recruit the best skills and monitor the activities of competitors is also well known in the literature. However, the recent surge of R&D by TNCs in selected developing host economies also reflects the quest for cost reduction and for accessing expanding pools of talent in these locations. It can be seen as a logical next step in the globalization of TNC production networks. It also resembles the international restructuring that has taken place in export-oriented manufacturing and ICT-based services through which TNCs seek to improve their competitiveness by exploiting the strengths of different locations. R&D internationalization to new locations outside the Triad is driven by a complex interaction of push and pull factors. On the push side, intensifying competition, rising costs of R&D in developed countries and the scarcity of engineering and scientific manpower along with the increasing complexity of R&D, reinforce the imperative to specialize as well as to internationalize R&D work. On the pull side, the growing availability of scientific and engineering skills and manpower at competitive costs, the ongoing globalization of manufacturing processes, and substantial and fastgrowing markets in some developing countries increase their attractiveness as new locations. The expanding pool of talent in selected developing countries and economies in South-East Europe and the CIS is very important in this context — notably in science-based activities — especially for companies that fail to find a sufficient number of skilled people in their home countries. In recent years, there has been a dramatic increase in the number of people enrolled in higher education in developing countries and economies in transition. In 2000-2001 China, India and the Russian Federation together accounted for almost a third of all tertiary technical students in the world. In addition, more scientists and engineers are staying in, or returning to, China and India to perform R&D work for foreign affiliates or local firms or to start their own businesses. In Bangalore, for example, some 35,000 nonresident Indians have lately returned with training and work experience from the United States. Reflecting the growing importance of the human resource factor, both developed and developing countries are now adopting new policy measures to attract skills from abroad. The internationalization of R&D is also facilitated by improvements in ICT and associated cost decreases, new research techniques that allow greater “fragmentation” of R&D and better information on research capabilities that are available worldwide. At the same time, overall improvements in host-country investment climates have all contributed to creating a more enabling framework. Important policy developments relate, for example, to intellectual property rights (IPR) protection, reform of public research activities, infrastructure development, and investment promotion efforts specifically targeting R&D-related FDI and R&D incentives. There are some fundamental reasons why the current trend towards R&D internationalization is set to continue. First, the competitive pressure on firms is likely to remain intense, forcing them to innovate more. Second, the need for greater flexibility in R&D in response to rapid technological change requires sizeable numbers of research staff with a range of specializations, and it necessitates locating R&D activities where such pools of researchers are available. Third, ageing populations in many developed countries are likely to result in an insufficient supply of specialized, up-to-date skills, forcing TNCs to look elsewhere for fresh talent. Fourth, through cumulative learning processes involving local enterprises and institutions, the developing countries that take part in the internationalization of R&D will progressively enhance their own ability to conduct more R&D. At present however, it appears that only a few developing countries led by China and India, and some economies of SouthEast Europe and the CIS, can effectively meet the conditions required to participate. … and has important implications for both host and home countries. The creation of knowledge is a driver of economic growth, but no single country can produce all the knowledge needed to stay competitive and to grow in a sustained manner. Countries are therefore eager to connect with international networks of innovation. Outward and inward FDI in R&D are two ways of doing so. R&D internationalization opens up new opportunities for developing countries to access technology, build highvalue-added products and services, develop new skills and foster a culture of innovation through spillovers to local firms and institutions. FDI in R&D can help countries strengthen their innovation systems and upgrade industrially and technologically, enabling them to perform more demanding functions, handle more advanced equipment and make more complex products. At the same time these benefits do not appear automatically, and unwanted effects can also arise. The main concerns in economies hosting FDI in R&D relate to the potential downsizing of existing R&D when FDI involves takeovers of domestic firms, unfair compensation to local firms and institutions collaborating with TNCs in the area of R&D, the crowding out of local firms from the market for researchers, a race to the bottom in attracting R&D-related FDI and unethical behaviour by TNCs. There may also be tensions between TNCs and host-country governments, in that the former may seek to retain proprietary knowledge while the latter seek to secure as many spillovers as possible. A key determinant of the development impact on a host economy is its absorptive capacity. Indeed, technological capabilities in the domestic enterprise sector and technology institutions are necessary not only to attract R&D but also to benefit from its spillovers. Other determinants are the type of R&D conducted, and whether the R&D is linked to production. The more a TNC interacts with a host developing country’s local firms and R&D institutions, and the more advanced the country’s national innovation system (NIS), the greater the likelihood of positive effects on a host economy. R&D internationalization also has implications for home countries — both developed and developing. It can help a country’s TNCs improve their competitiveness by accessing strategic assets and new technologies, acquiring unique knowledge at competitive prices, increasing specialization in their R&D, reducing costs, increasing flexibility and expanding their market shares. By extension, the improved competitiveness of TNCs often has positive impacts on their home economies. Foreign R&D can generate opportunities and spillovers in the home economy to the benefit of local firms and the home economy as a whole. Enterprises are the principal agents of innovation. However, they do not innovate and learn in isolation, but in interaction with competitors, suppliers and clients, with public research institutions, universities and other knowledge-creating bodies like standards and metrology institutes. The nature of these interactions, in turn, is shaped by the surrounding institutional framework. The complex web within which innovation occurs is commonly referred to as the “national innovation system”. Its strength can be influenced by government intervention. A number of policy and institutional areas need to be addressed to attract FDI in R&D, to secure the benefits that it can generate and to address potential costs. The starting point is to build an institutional framework that fosters innovation. Particular policy attention is needed in four areas: human resources, public research capabilities, IPR protection and competition policy. Efforts to secure an adequate supply of human resources with the right skills profile involve educational policies — not least at the tertiary level — and measures to attract expertise from abroad. For public R&D to contribute effectively to the NIS, it is essential that it links with enterprise R&D and that public research institutes promote the spin-off of new companies. The attractiveness of a location for conducting R&D may increase if the IPR regime is more effective, but a strong IPR regime is not necessarily a prerequisite for TNCs to invest in R&D. The policy challenge is to implement a system that encourages innovation and helps to secure greater benefits from such activity, notably when it involves TNCs. At the same time, in order to balance the interests of producers and consumers, IPR protection needs to be complemented by appropriate competition policies. Efforts in these areas need to reflect the comparative advantage and technological specialization of each country as well as the development trajectory along which a country plans to move. FDI policy is also vital to promote the desired forms and impacts of FDI. Selective policies in this area can include targeted investment promotion, performance requirements and incentives along with science and technology parks. IPAs can play an important role in a country’s strategy to benefit from R&D internationalization by TNCs. It can potentially serve two prime functions. The first is to communicate and market existing investment opportunities, for example, through targeted promotion, based on a careful assessment of the locations’ strengths and weaknesses and a good understanding of the relevant locational determinants. If a location is unlikely to be able to offer the conditions needed to attract R&D by TNCs, an IPA may be better off focusing on its policy advocacy function. It may draw the attention of other relevant government bodies to areas that are important for making a location better equipped to benefit from R&D by TNCs. In a global survey of IPAs conducted by UNCTAD, a majority of the respondents were found already to target FDI in R&D. A large majority of IPAs in developed countries actively promote FDI in R&D activities (79%), and 46% of those based in developing countries do so as well. The highest percentage (94%) was noted for IPAs in Asia and Oceania. Conversely, a majority of IPAs in Africa promote it actively, and only 11% of the IPAs in Latin American and the Caribbean do so. Finally governments need to pay attention to more focused policies aimed at boosting the capabilities of the domestic enterprise sector, notably through industry-specific and small and medium-sized enterprise policies. The various objectives of education, science and technology, competition and investment policies can be mutually reinforcing. Whether a country tries to connect with global networks by promoting inward FDI, outward FDI, licensing technology, the inflow of skills or through any other mode, policies need to be coherent with broader efforts to strengthen the NIS. The stronger the NIS, the greater is the likelihood of attracting R&D by TNCs and of benefiting from spillover benefits generated by such R&D. In essence the policies pursued need to be part of a broad strategy aimed at fostering competitiveness and development. Indeed, the emphasis on policy coherence may be one of the most striking lessons learned from those developing countries that are now emerging as more important nodes in the knowledge networks of TNCs. In most of these countries, the starting point has been a long-term vision of how to move the economy towards higher value-added and knowledgebased activities. The success of some Asian economies is no coincidence; it is the outcome of coherent and targeted government policies aimed at strengthening the overall framework for innovation and knowledge inflows. In some form (and to varying degrees), they have actively sought to attract technology, know-how, people and capital from abroad. They have invested strategically in human resources, typically with a strong focus on science and engineering; invested in infrastructure development for R&D (such as science parks, public R&D labs, incubators); used performance requirements and incentives as part of the overall strategy to attract FDI in targeted activities; and strategically implemented IPR protection policies. For many developing countries at the lower end of the UNCTAD Innovation Capability Index any expectation of a major influx of R&D by TNCs would be unrealistic in the short term. However, that is not an excuse for a lack of action. Rather, countries should consider how to begin a process through which economic and technological upgrading could be fostered. The creation of innovative capabilities is a path-dependent and long-term task. For latecomers, ensuring that a process aimed at strengthening their NIS gains momentum is an essential first step. For home countries, current trends accentuate the need to rely even more on the creation, diffusion and exploitation of scientific and technological knowledge as a means of promoting growth and productivity. Rather than regarding R&D internationalization as a threat, home countries should seize opportunities arising from it. It is important to explore new ways of collaborating with the new R&D locations (e.g. through joint research programmes and careful attention to the benefits and costs of outsourcing and R&D-related outward FDI). Countries should also try to remove bottlenecks and “systemic inertia” in their NISs to be better positioned to benefit from R&D internationalization. They may also see the need to specialize more in areas where they hold a competitive edge to strengthen existing world-class centres of excellence and build new ones. …taking developments at the international level into account. Policy-making at the national level also has to consider developments in international investment agreements at various levels. Many international agreements give special attention to investment in R&D activities. Key issues relate to the entry and establishment of R&D-related FDI, the treatment of R&D performance requirements (whether by restricting or explicitly permitting them), incentives encouraging investment in R&D activities, and the movement of key personnel. In general, international investment agreements confirm the importance of policies that seek to facilitate FDI in R&D. While most countries welcome FDI in R&D, many governments do not allow foreign companies to draw on certain kinds of public R&D support. Many bilateral agreements also state explicitly that governments are free to apply R&D requirements as a condition for receiving preferential treatment (e.g. an incentive). A small number of agreements prohibit the use of mandatory performance requirements in the area of R&D. Most international investment agreements do not have provisions that specifically protect R&D-related FDI; they protect FDI in general. Related provisions include the definition of investment, the free transfer of returns arising from R&D activities and the application of the national treatment and most-favoured-nation standards to foreign investors. The protection of IPRs at the international level and minimum standards set by international treaties are of particular relevance for R&D-related FDI. The most important instrument in this area is the WTO Agreement on Trade-related Aspects of Intellectual Property Rights (TRIPS). Some recent agreements at the bilateral and regional levels have extended the minimum standards set in the TRIPS Agreement. The protection of IPRs enshrined in these agreements is intended to encourage the development of proprietary knowledge; but at the same time, it limits the policy space of States in an area that is directly relevant to R&D activities. For developing countries it is therefore important to understand and make use of the flexibilities contained in the TRIPS Agreement. There is also a clear need for additional technical assistance to facilitate the implementation of IPRs in a development-friendly manner. Some international investment agreements also encourage home countries to support the strengthening of NISs in developing countries, by promoting outward R&D-related investment in developing countries. In addition, international cooperation agreements in the areas of science, technology and innovation help create an enabling framework for R&D internationalization by facilitating the flow of information, the formation of alliances, the pooling of financial resources, the improvement of access to technological expertise, matchmaking and the establishment of privatepublic sector partnerships. But there is scope for more cooperation to foster policy formulation and stronger innovation systems in developing countries. One key area is human resource development. The international community could play a more active role in this area, for example, by supporting the strengthening of the local educational infrastructure and by making educational opportunities to developing countries available in developed countries. Home countries could contribute to the improvement of the institutional framework for innovation in developing countries by assisting in the establishment of technical standards and certification systems through access to and provision of testing equipment for standard setting and quality assessment. Similar steps could be taken with regard to the implementation of IPR systems and through R&D collaboration between institutions in developed and developing countries. Policies at the international level have direct implications for the ability of developing countries to formulate their R&D policies and to create the conditions that will enable them to benefit from the internationalization of R&D by TNCs. TNCs are internationalizing R&D, including in developing countries … …with important implications for innovation and development. TNCs are the drivers of global R&D. Their R&D is growing particularly fast, though unevenly, in developing countries … … and the type of R&D undertaken varies by region The process is driven by new push and pull factors, and is facilitated by enabling technologies and policies ... … and has important implications for both host and home countries. Appropriate policy responses are needed at the national level… …taking developments at the international level into account.